During a pilgrimage I was on last summer, I found myself staring at an image of the second Station of the Cross, when Jesus carries His cross. What was different about this particular depiction I was looking at, though, was that this was the moment right before Jesus began to carry His cross. In the icon, Jesus’ hands were open and extended towards the cross in an inviting way—in a way that accepted what was to come, and that was intentionally willing what was going to happen next. Jesus was pursuing God’s will for Him; He was accepting the cross as it was about to be handed to him. Standing before this image, I felt slightly breathless, because before me stood our Lord Jesus showing me how to live and how to die. The Crucifix typically does this for me, but this icon cemented in my mind Jesus’ obedience and His will, His very own decision and volition to follow the Father’s will for Him. Perhaps it’s because I will most likely not die a martyr’s death on a cross that the crucifix can sometimes be hard to relate to. But that moment before Jesus picks up His cross? The moment when Jesus has an opportunity to respond to the situation? This is a moment I see happen in my everyday life, multiple times a day. This is a moment I can relate to more easily on a daily basis. One opportunity for my husband and I to respond arose when we faced multiple health trials; we didn’t know what would happen, so we turned to Jesus. And so my prayer today is that we all are able to trust that the Lord our God has a plan, and that our Savior Jesus Christ has already walked this road ahead of us—and even better, continues to walk it beside us. 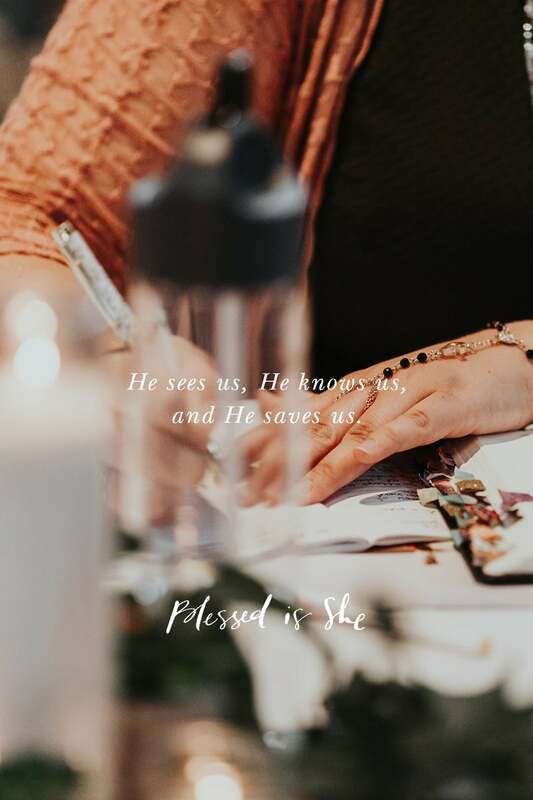 He sees us, He knows us, and He saves us. He sees us, He knows us, and He saves us. Let’s pray for one another, sisters, to embrace our crosses with joy today. Beautiful! I love the way you brought attention to Jesus opening his hands to take his cross. This inspires me to open my hands as God so lovingly hands me my cross daily. The crosses I must carry are so difficult yet they actually have brought me joy, humility, grace and growth. It has also given me the greatest gift and that is to spend more time with those I love the most on this earth. I wouldn’t want my life to be any other way. This is a powerful day. Our Lord poured out his grac3 on his sinful children. Called us home by crucifying his most beloved son in order to save us from ourselves.